Pizza and wings: Two of the most important food groups. And according to WTOP readers and listeners, getting the best of both in the D.C. region only requires one stop. WASHINGTON – Pizza and wings: Two of the most important food groups. And according to WTOP readers and listeners, getting the best of both in the D.C. region only requires one stop. The votes are in and Ledo Pizza is the winner of WTOP’s Top 10 for best pizza and best wings. “I was surprised by the wing pick,” admits James Beall, president and chief operating officer of Ledo Pizza. “The wings are kind of new for us, being that they’ve probably been on the menu for 22 years now, while the pizza’s been the same since 1958,” Beall says. Around six or seven years ago, some customers began telling Beall they were coming to the Ledo Pizza restaurants primarily for the wings. “We really started pushing [the wings]. We got proud of them, and it just kind of took off from there,” he says. According to Beall, the use of “jumbo” wings allows the final product to be crisp on the outside, without being dry on the inside. But despite the popularity of the wings, pizza still remains top for the Maryland- based company. Beall estimates that pizzas outsell orders of wings 5-to-1. The secret to the success may be a common ingredient. Both the buffalo wing sauce and Ledo’s famously sweet pizza sauce start from the same base. “We took one good thing and just kept using it over and over again,” Beall says. 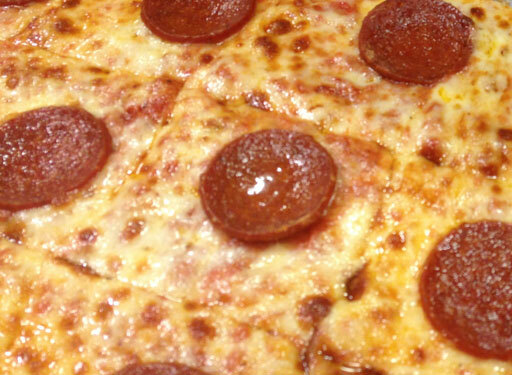 The rectangular-shaped, pastry-style dough is also a defining characteristic of Ledo’s pizza. “We hear a lot about the crust, but we probably hear more about the sweetness of the sauce than the crust, itself,” Beall says. Another ingredient that sets the pizza apart from the others? The cheese. Beall says smoked provolone cheese goes on top of the sauce, instead of mozzarella, which is used by most pizza makers. At the Ledo Pizza location on River Road in Bethesda, Md., customer Willie D. Stamp orders both a pizza and an order of wings. The original Ledo Pizza opened in 1955 in Adelphi, Md. See the full list of WTOP winners and the runners-up in the Top 10 photo gallery.